This work has been released into the public domain by its author, Grayghost01 at the Wikipedia project. This applies worldwide. Grayghost01 grants anyone the right to use this work for any purpose, without any conditions, unless such conditions are required by law. Transferred from en.wikipedia to Commons by Common Good using CommonsHelper. 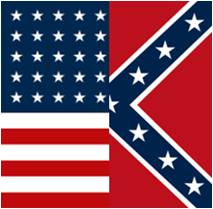 15:35, 25 June 2015 1,875 × 1,875 (103 KB) Fitnr Use first flag of the confederacy rather than battle flag. Matches header on portal page. 10:57, 7 October 2013 213 × 209 (28 KB) MarcusBritish Tone magenta/hot-pink to red.